Skin infections by dermatophytes or yeasts. 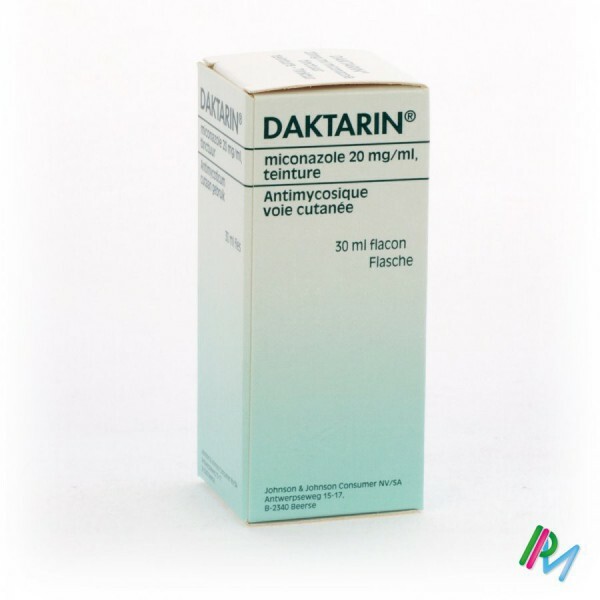 Since miconazole exerts an antibacterial effect on gram positive bacteria, can also be used Daktarin cream in mycoses caused by such bacteria are gesuperinfecteerd. nails and nail bed infections by dermatophytes or yeasts, possibly gesuperinfecteerd by gram positive bacteria. combined with cream designated by: - luierdermatitis by Candida - the treatment of skin folds (groin, inter-digital ... folds) were infected by dermatophytes and yeasts and whether or not gesuperinfecteerd by gram positive bacteria. The powder can also be used prophylactically in stockings and shoes (eg sportsmen). 20 mg (R 14 889) per gram of cream. Other ingredients: PEG-6-(PEG-32) Glycolstearaat - macrogolglycerol oleate - Liquid paraffin - Butylated hydroxyanisole - benzoic acid - water. 20 mg miconazole (R 18 134) per ml of tincture. Other ingredients: Polyacrylate 525 - 515 Polyacrylate - Propylene glycol - Denatured ethanol. 20 mg miconazolenitraat (R 14 889) per gram of powder. Other ingredients: Silicon Oxide - Zinc oxide - Talk. 2 times a day on the injury and make Rub the finger. For most minor injuries sufficient ± 1 cm cream. The application under an occlusive dressing brings no advantage and is therefore not recommended. Push cap reversed on the tube until the sharp point through the tube punctured. 2 times a day at the nail and nail bed or the application using of the brush. The infected nails are best cut as short as possible. It is recommended that any new application to clean the nail with a cotton wad soaked in acetone. 2 times a day (or 1 time if it is combined with cream) to treat injuries on the scatter. For prophylactic use in shoes and stockings sufficient time 1. Huidmycosen duration of treatment with local antifungal preparations varies from patient to patient. The broad principle is that it treats at least one weeks after clinical cure, mycological cure because often with a lag. Will average 2 to 6 weeks to a huidmycose to treat, depending on the location of the injury. a known contact allergy for miconazole and other imidazole containing antimycoïca or vehicle. 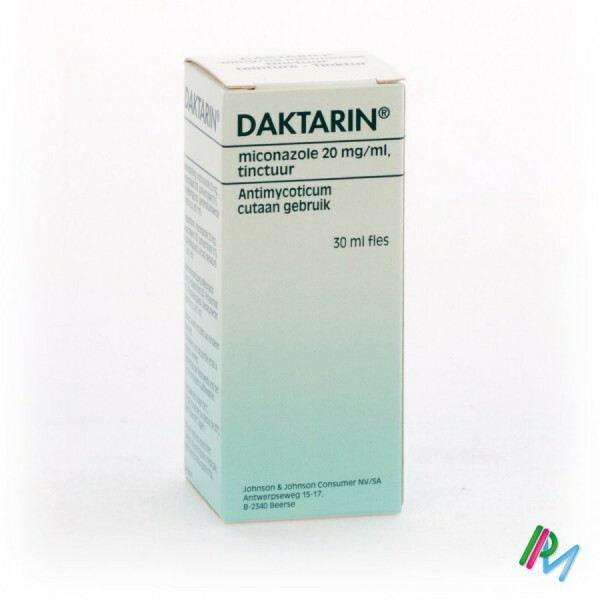 any form of Daktarin may be used in the eyes or on open wounds. The tincture should not come into contact with mucous membranes. 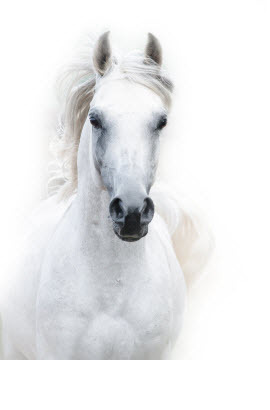 If a hypersensitivity reaction or irritation occurs, treatment should be discontinued. Daktarin cream, tincture and powder-can without problems during pregnancy and lactation are used. Rare cases of irritation and burning are reported. 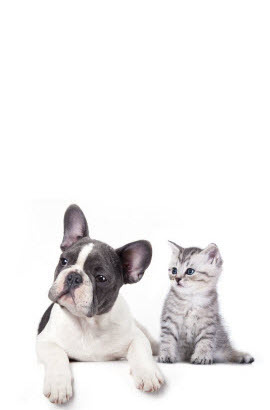 As with any substance on the skin is made, in rare cases both miconazole and on the components of an allergic reaction occur vehicula. Daktarin does not stain skin or clothing. Excessive topical use of all forms can Daktarin skin irritation. A brief interruption of treatment or reducing the number of applications is sufficient to remedy the situation. The accidental taking Daktarin cream or powder, the absorbed fraction so low that no effect comes from. We have no specific measures to be taken. If the tincture taken in error, then stomach irritation may occur. The administration of alkalis normally sufficient for treatment. Possibly a gastric lavage may be considered. Resorption is not expected, since on contact with air film formation occurs immediately. When people are addicted to sniffing of volatile solvents-Daktarin tincture would use to maintain their addiction, could theoretically and in the long term toxic polyneuropathy can arise very slowly reversible after cessation of use. If desired, it is possible to salicylic acid cream in the process, eg for the treatment of hyperkeratotic lesions on the feet.